The other night, C. was humming the song “Oh, Pretty Woman” by Roy Orbison. That reminded me of the 90s movie “Pretty Woman”, starring Richard Gere and Julia Roberts. I don’t know about other countries, but this movie was very popular in Spain. So I asked him: “Have you watched the movie?”. “Is there a movie?”, he replied. “Well, the song is not from the movie, but yes, there is a movie from the 90s called “Pretty Woman”, do you know it?”. “No… you know, in the 90s in China we only watched Lei Feng* movies”. 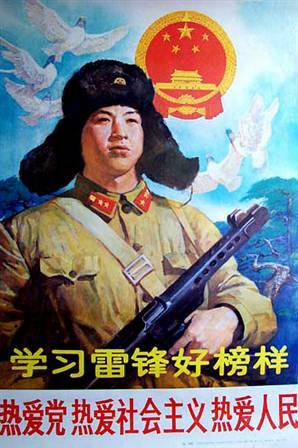 Chinese propaganda poster of Lei Feng by Qiu Wei (丘玮) from Wikipedia. *From Wikipedia: Lei Feng was a soldier of the People’s Liberation Army of China. After his death, Lei was characterized as a selfless and modest person who was devoted to the Communist Party, Chairman Mao Zedong, and the people of China. In 1963, he became the subject of a nationwide posthumous propaganda campaign, “Follow the examples of Comrade Lei Feng. Lei was portrayed as a model citizen, and the masses were encouraged to emulate his selflessness, modesty, and devotion to Mao. Although someone named Lei Feng probably existed, the accounts of his life as depicted by Party propaganda are heavily disputed, leading him to become a source of cynicism and subject of derision among segments of the Chinese population. Nevertheless, Lei’s image as a role model serviceman has survived decades of political change in China. The conversation reminded me of a post about childhood cultural references that I wrote a few months ago. One more movie to the list! Only watched Lei Feng movies in the 90s! That sounds like a very sad childhood movie-wise for Chinese kids. Though Chinese TV now isn’t much better with all those silly WWII anti-Japanese shows. Haha yes, Chinese tv serials are so bad! The acting is horrendous!! And always the same topics: Japanese invasion, Communist rising, old dynasty life in the palace. That’s it! How did C know the song? I mean, it came along way before the movie, but it’s not popular now. I have never watched one but I am going to take a risk and say: I don’t think so, haha. Oh yes, he also often mentions Stephen Chow! I tried to watch his Journey to the West from the 90s but it was very confusing. I guess it’s the same way my bf would feel watching Neverending Story or Labyrinth! Nah I don’t think you need to waste time watching Lei Feng movies, I’m sure they are not good at all! What an incredible difference between two movies and two cultures. I loved Pretty Woman!! I loved Richard Gere. never seen any Lei Feng movies. I am a sucker for romantic movies. When I was a kid, cowboy programs were popular on TV–cowboys vs. Indians, sheriffs vs. bank robbers, cattle ranchers vs. sheep farmers. The movies were much better. I was partial to Rogers and Hammerstein musicals like South Pacific and Oklahoma, but I also liked adventure stories like The Three Musketeers and The Man in the Iron Mask. It wasn’t until I started dating my husband that I learned to like (some) martial arts movies. I guess in those years, martial arts movies were for guys like superhero and special effects movies today! And yet there can be a surprising connects with cultural references points too. I will never forget an evening in Canada. My partner had picked up some records. My sister and her partner were home. My sis and I were sitting on the sofa and the guys were going through the records. Completely absorbed and animated comparing concerts and trivia… Both (at the time) in their 50s having grown up in separate sides of the world… they were exactly the same generation with shared experiences through music, bands, gigs and more! Yes, it seems for a number of years that was basically the only thing they exported. Now they export all the things we buy! I grew up in the Lei Feng era in China, it was one of those things I didn’t know it was real or a myth. During that time, you kind like lived in a surreal world– because you couldn’t think for yourself and you couldn’t speak for yourself. Later I found out that the whole thing was a fabrication, just like many things in China. Nowadays, thanks to Internet, people have exposure to enormous amount of information, but so many people still don’t want to think for themselves or refuse to see the reality. Do you know how many people in China miss that period of time and want to go back?p to the Lei Feng era? I don’t know, how many? A lot? :/ But are they people who actually lived during that time, or just naive and dreamy types who think the past is always better? In Spain we also have some people who say things were better during the dictatorship (1939-1975), OMG! !